Come and visit us. 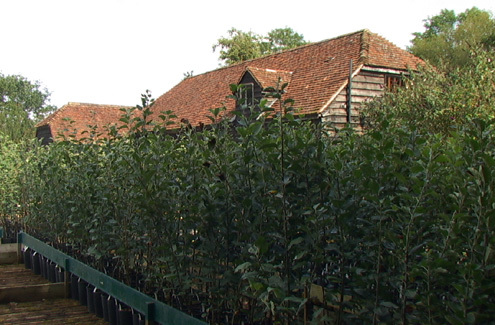 You will not find a larger range of rare fruit trees ready to take away, all container grown and ready to plant now. Free advice on all aspects of growing. Our trees will carry on growing in your soil well into the autumn and roots grow even when the leaves have fallen. There is no reason to wait for bare root trees, which will not grow until Spring and will have to establish new roots. We also send out trees by courier. See the How To Order page for details, prices etc. We collect, conserve, grow and sell trees of traditional British fruit varieties. They are container grown, can be planted at any time of year and can be collected from the nursery or sent out by courier throughout the year. Please see opening times below. An 84 page descriptive catalogue is available for a modest charge. Please telephone. There is no online ordering of trees, given the range and quickly changing availability. Our trees are rare and living things, which cannot be ordered up out of a warehouse. Customers are welcome to advice at the nursery or on the telephone. Our range includes several hundred varieties covering apples, pears, plums, gages, cherries, vines, medlars, quinces, and some soft fruit. We also graft new trees from customers' own treasured old ones. 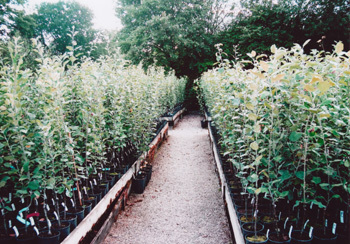 Our trees are grafted on a range of rootstocks and customers can choose whichever is most suitable for the shape and size of tree, bush or restricted form they want. 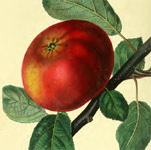 Much of our work involves research and conservation of old varieties, ancient trees and orchards. If you have any knowledge of these, which you think would be of interest to us, please let us know. They are fast disappearing and time is pressing. Often, we advise private owners of trees and orchards on an informal basis, but we also undertake more formal consultancy on a fee-paying basis for larger and longer term projects. Please telephone for details. Months in blue - Open 10.00 to 17.00 Tuesday to Sunday inclusive. Also open bank holiday Mondays in blue months, but closed Christmas Eve to New Year's Day, inclusive. Months in red - Closed, but we are usually here and visitors are welcome by prior arrangement.